The 1934 half dollar value is a minimum of $6.56 - this is the how much a very worn coin is worth, and it can easily go higher. These old silver half dollars are valued depending on the amount of wear they have received. 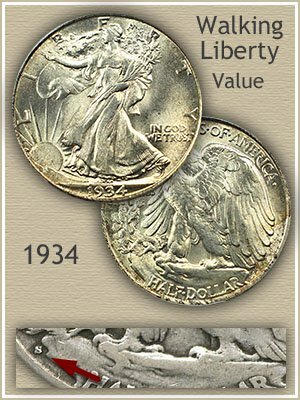 Your coin is part of the middle years of the Walking Liberty series, and not as commonly found as those minted in the 1940's. However the all important consideration is the condition of your coin. Examine closely all of these early half dollars as to wear. Collectors refer to it as "grading" your coin. The "uncirculated" 1934 half pictured is an example of a seldom found coin because of its condition. It is easily worth $62 to $100. You can grade your coins by comparing them to the images below. 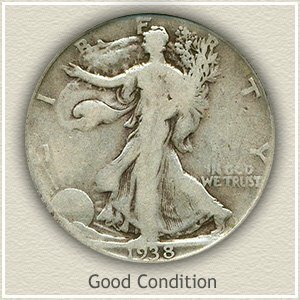 Your old Walking Liberty half dollar, as it is know by collectors, is considered one the best of all US coinage designs. Its stately beauty plus large size attracts many collectors, often beginning their sets with coins of all different stages of wear. There is with each date a wide range of value, from heavily worn examples worth silver to stunning gems where the value of a 1934 half dollar can reach hundreds of dollars. All 1934 half dollars are further separated in value depending on mintmarks, a small initial indicating which mint - Philadelphia, Denver or San Francisco produced the coin. Your coin would have the highest value if struck at the San Francisco mint, noted by an "S." The Denver mint used a "D" and Philadelphia did not use a mintmark. An "D" or "S" is found on the reverse close to the rim. Of the almost seven million 1934 half dollars struck at the Philadelphia mint, pictured is one of the finest surviving today. Many qualities set this coin apart. From a distance it is just stunning. When viewed close-up the features of the design are bold and sharp, the result of a full and complete strike. What is missing, also adds to the value, nicks, scuffs and abrasions are not distracting from the original stately design. No wear disrupts the blue-white luster allowing it to remain over the entire coin. Offered at a David Lawrence rare coin auction, bidding continued until a final $529 was reached. A coin destined to find a home in a top quality collection of Walking Liberty half dollar. 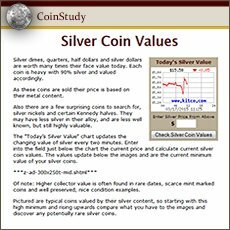 Once you determine date and mintmark, the condition of your old silver half dollar drives the price. Collectors and dealers pay high premiums for coins in better than average condition. Judging the state of preservation allows you to find an accurate value of your 1934 half dollar from the chart above. Condition separates common from rare silver coins. 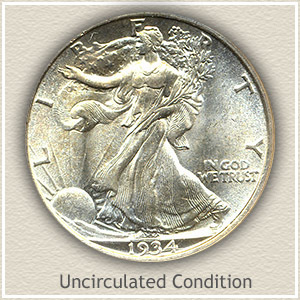 Uncirculated: A coin without wear is considered as "uncirculated" condition. Viewing you coin under a light, slowly rotate it, the shine and luster is continuous from edge to edge. Circulation renders the tops of the designs dull by removing the delicate luster. Look for this running down the center of Liberty. If you can confirm your 1934 half dollar is uncirculated it is at the high end of value. 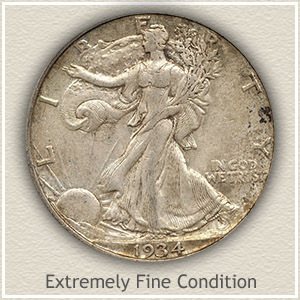 Extremely Fine: Evidence of some light wear but remaining bold is a coin in "extremely fine" condition. Showing the greatest amount of design loss is the area through the center of Liberty. Folds in her gown have worn smooth over the area of her leg. Once rounded features, the branches, sun rays and Liberty's face now are flattened slightly from circulation. Good: Heavy wear covers the entire surface of your coin in "good" condition. Liberty's left arm has merged with the branches and her waist, the hand no longer visible. Rays extending from the sun have faded, the center ones missing half their length. Turning your attention to the rim it is often just touching the letters. 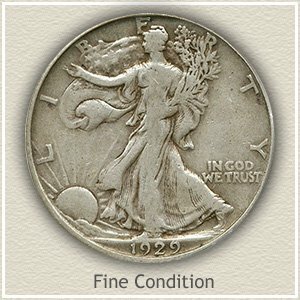 Still desirable to collectors, 1934 half dollar value remains high. Return to Coin Values Discovery... find 1934 half dollar value and... It is an excellent index with images and text links to all coin series, from Cents to Gold. Value charts, grading images and descriptions uncovers the common to rare coin values found in your box of old coins. Listing all dates and mintmark combinations of this very popular series including more on 1934 half dollar value. Many of these old half dollars are worth premiums above their silver coin values. After you check date and mintmarks, next compare your coins to the grading images and determine their condition. A small difference in preservation does have an effect on value.